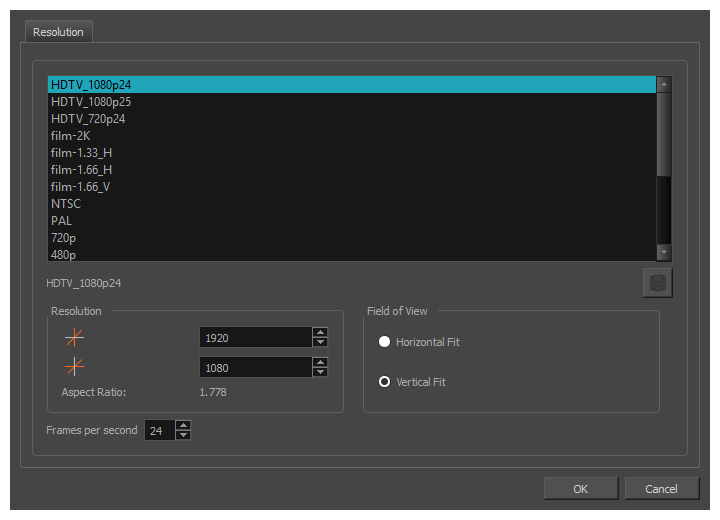 The Scene Settings dialog box lets you select settings for the resolution of your scene. You are already required to select resolution settings when creating a scene, but those settings can also be modified later using the Scene Settings dialog box. 720p-240p: A series of standard widescreen presets named after their resolution heights. Allows you to save the current resolution settings as a new preset. If you have a resolution preset selected, this button is only available if you have made changes to the resolution since selecting the preset. You will be prompted to type in the name of the new resolution preset. Resolution The resolution of the scene defines the width and height of the canvas in pixels. By default, the scene will be rendered in this resolution. NOTEObjects in Harmony are positioned in fields, based on a traditional animation grid which extends to 12 fields from the center in each direction, and which has 4:3 proportions by default. In a scene with 4:3 proportions, this grid fits the camera field perfectly. However, since most scenes have an aspect ratio of 16:9, the grid does not fit the camera field perfectly. If the field of view is Horizontal Fit, the grid's width will match the scene's width, but will extend beyond its vertical edges. If the field of view is Vertical Fit, the grid's height will match the scene's height, will not extends to its horizontal edges.